My family had been enthusiastic about it until recently: my husband announced last summer he’s had it. He won’t travel with me to Mexico when he wants us to vacation, together. So when I suggested we go visit for the December holidays, he said “no, no, no Pati, you can’t control yourself there.” I kept pursuing Mexico because I missed it so bad, seeking out a place where I wouldn’t be tempted to work. San Miguel de Allende sounded like just the spot. 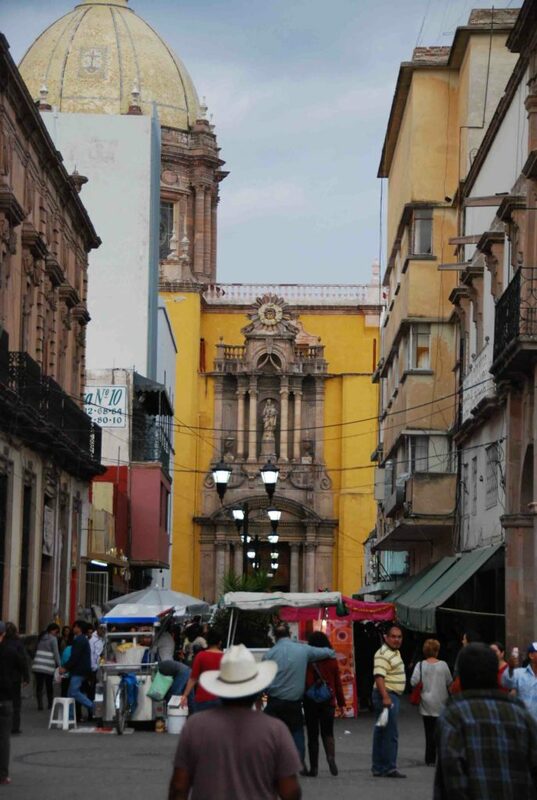 San Miguel is a beautiful colonial town in the state of Guanajuato in central Mexico. It’s artsy, has a ton of history, gorgeous views of the mountains, quaint hotels and shops. There are a bunch of activities to do with the boys. But mostly, to my knowledge, it doesn’t have any regional food specialties to incite me to work. With this, I convinced him it was the perfect place to relax and, when it came to food, just enjoy it for once. San Miguel is only a few hours by car from Mexico City, where we’d be picking up my mom who’d be joining us for a few days. It was in looking at the map to plan our drive that I noticed the city of Celeya is only a stone’s throw from San Miguel. 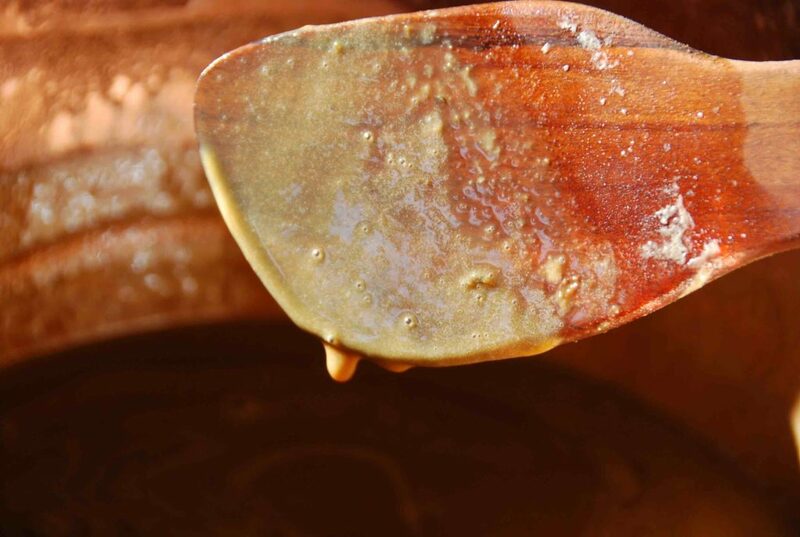 Celeya is the birthplace of Cajeta: one of the most irresistible of Mexican sweets. I have wanted to go since I was like 5 years old. I tried to contain my very desperate need to go to Celaya the first day we were in San Miguel. As I got out of bed on the second day, the escapade to Celaya was already on the works. 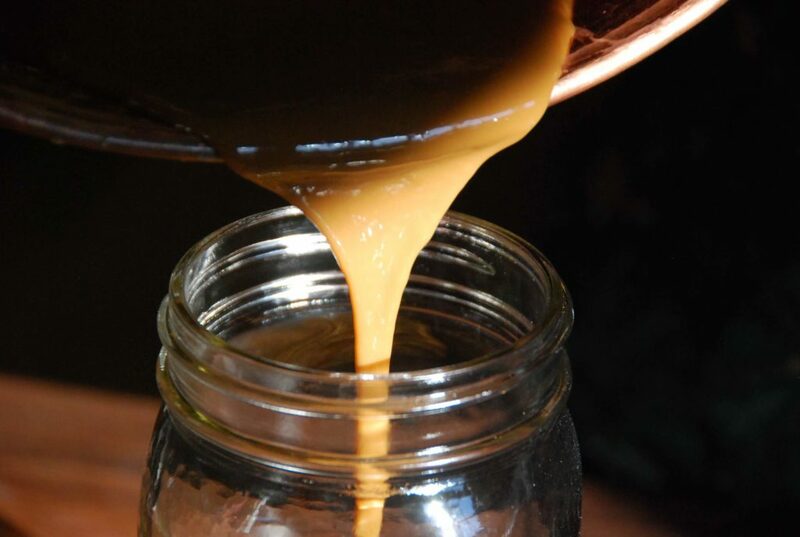 Cajeta is a caramel-like concoction, yet more milky and silky, and with a deep, rustic and almost nutty flavor. 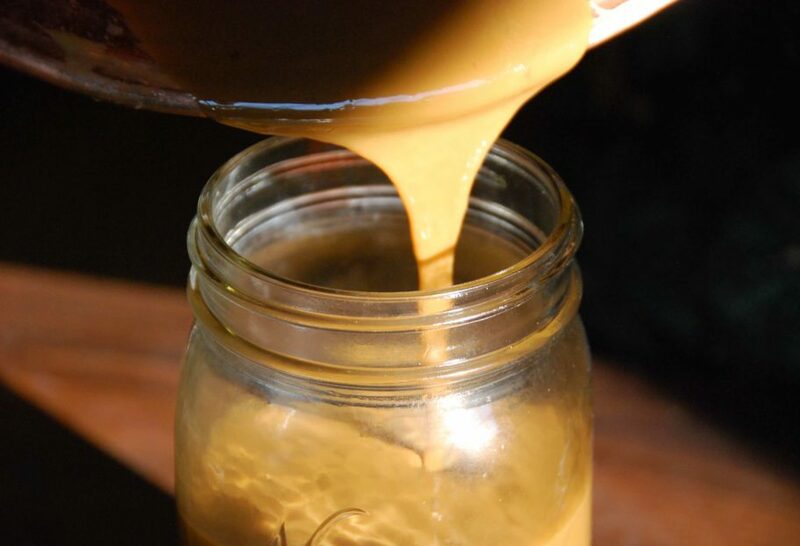 It’s Mexico’s version of Dulce de Leche, yet we pride ourselves in that Cajeta came to be long before Dulce de Leche and we tend to make ours with goat’s milk (or a combination of goat and cow’s milk) rather than only cow’s milk and ours has a much more intricate and richer taste. Thankfully, the dynamic woman in charge of San Miguel tourism office has friends and family in Celaya. She knew who to ask and help organize exactly where to go: La Tradicional de Salgado. 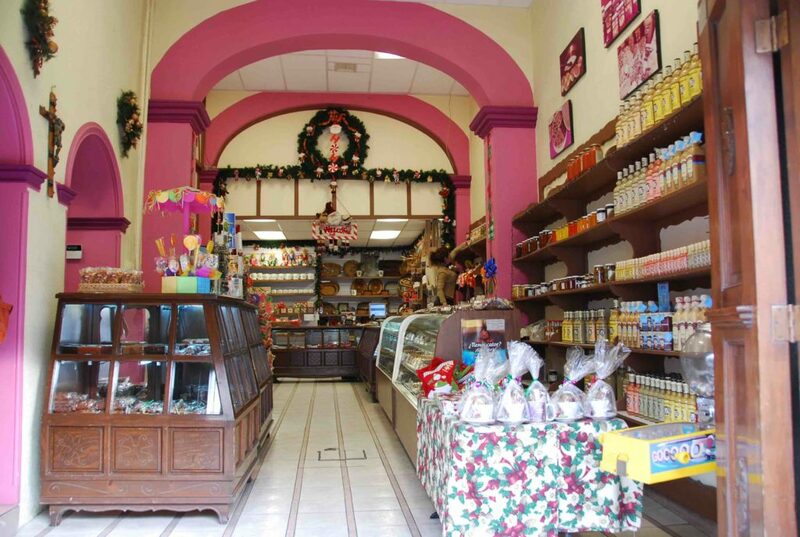 The storefront has sweets made with or combined with Cajeta along with other traditional sweets. 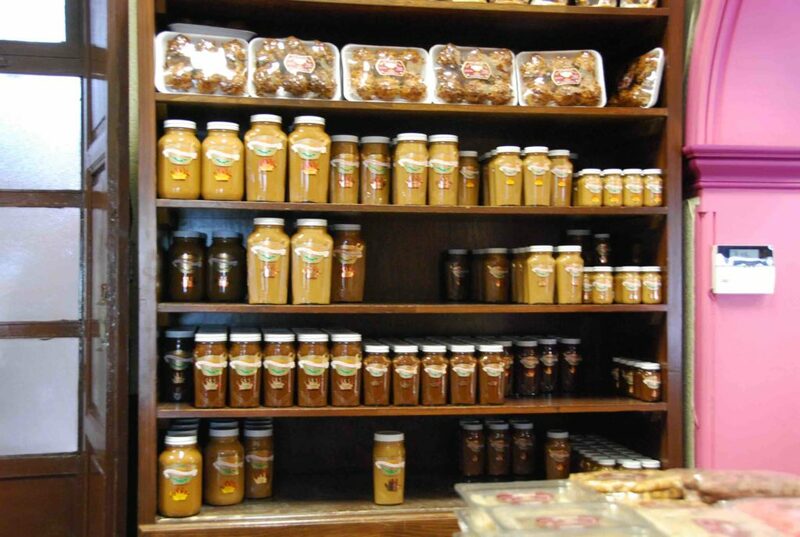 The side of the store, is reserved for Cajeta. At La Tradicional, Cajeta continues to be made the way they started making it in 1860, which happens to be the most traditional way. They make a small quantity, which is sold immediately after, and sometimes even before, it is bottled. They have Cajeta de Vainilla (vanilla flavored and the lightest in color), Cajeta Quemada (translates to burnt and it is the darkest in color and flavor), and Cajeta Envinada (translates to flavored with wine but rather than wine it is flavored with rum). As the manager Andrés López explained, all Cajetas at La Tradicional begin the same, yet they don’t end the same. 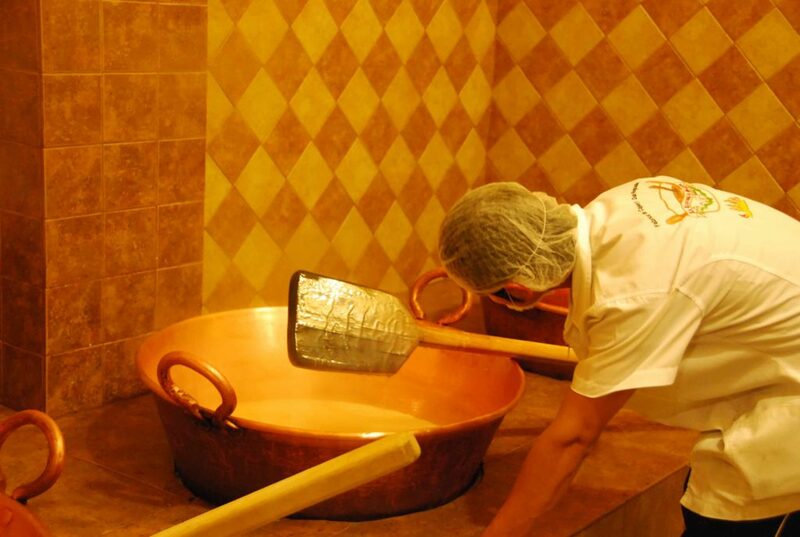 They all start with 40 liters of fresh goat milk poured into a gigantic copper pot and mixed with brown sugar. It is then brought to a steady simmer at 120 degrees for most of the cooking time. If it will be vanilla flavored, then vanilla extract gets added. If it will be Envinada, then a generous splash of rum goes in. If it will be burnt, it is just like the vanilla one, yet it is cooked double the time (about 9 hours instead of 4 or 5), to achieve a much more concentrated flavor and thicker consistency: to the point where if it was left to simmer for a minute longer it would practically burn. 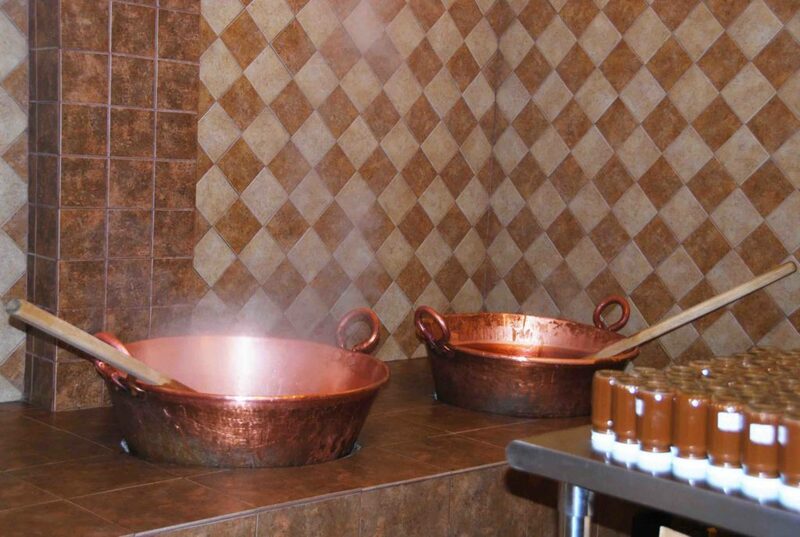 They always use those copper pots that get cleaned after each use and gigantic wooden spatulas. 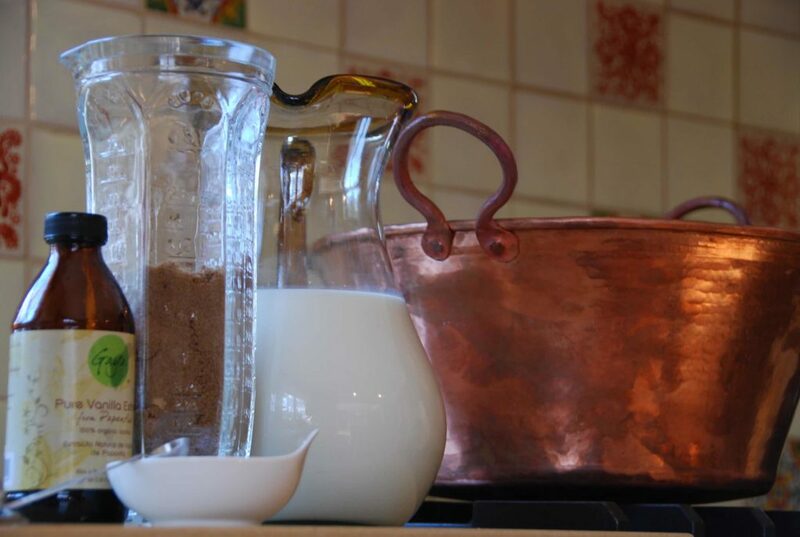 No metal spoons or utensils to stir the milk, as copper is a very reactive material and Cajeta a sensitive product. Those wooden spatulas are used to stir the milk regularly as it cooks down. 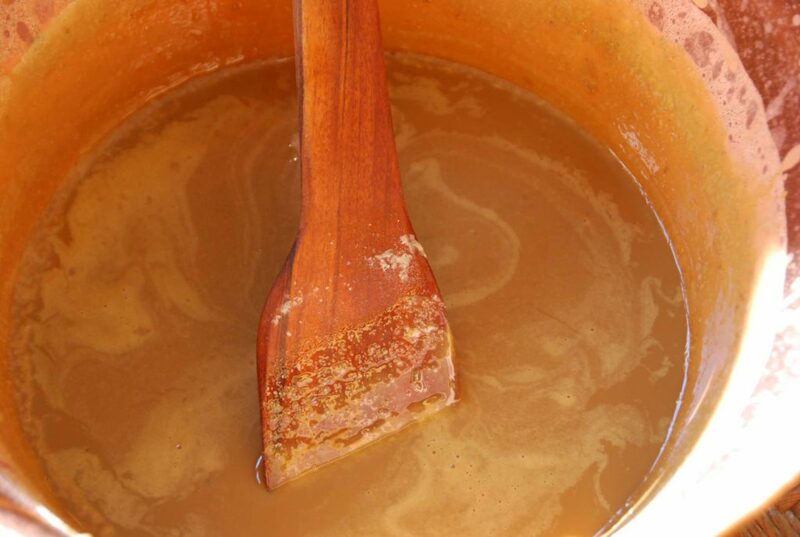 The heat is left at a steady temperature to have a consistent medium simmer, adjusting the temperature as the Cajeta reduces. They know Cajeta is ready first, by judging for the design it leaves on the wooden tool: see the waves above? They have to show up after you stir and raise the spatula. Also, the mixture has to be thicker, like caramel! Lastly, as you stir the pot with the wooden spatula, there has to be a delayed trail behind the spatula, that allows you to see the bottom of the pot if only for an instant. The Cajeta is left to gently cool. The glass jars are filled up, immediately closed and turned upside down. This creates a vacuum seal. At La Tradicional, they switched the bottle design 30 years ago. It used to be plain and round. They wanted a change that made it look a bit more dressy. I say they look pretty dressed up! We tasted all the Cajetas and so many sweets. We stirred the pots, with our heads covered in protective nets and talked to everyone in the store. We all came out with our very favorite one and Juju managed to eat an entire small jar of the vanilla kind, by the spoonful. As we walked outside, we found a city brimming with food wonders. We ate some of the best Empanadas we have ever tried in a place that had, oh, about, 100 people waiting in line: there were about 30 different kinds! Half a block ahead we ate some outrageous Gorditas, thin and large, they were stuffed with either spicy queso fresco or Almidón (which I had never tried: the inner part of the Chicharrón). Our Celaya hosts brought Duraznos Prensados (Sweet pressed apricots) for us to try as well as Pastes (gummy-jelly soft squares) with such exotic flavors as guava and Rompope. One of the biggest treats: see that red stand in that photo above? The woman in charge was selling Celaya made copper pots, one more beautiful than the other. After much chatting and measuring the different sizes, I bought my very own, which I carried all the way back to DC, to start making this Cajeta below, so that you can also, make your very own. There’s my big copper pot, but you can use any wide bottomed and tall pot. Goat’s milk (you can choose to combine it with or use all cow’s milk, but goat’s milk gives it that delicious musky flavor…), dark brown sugar (or shredded piloncillo) and Mexican vanilla. Bring it all to medium simmer, over a steady medium heat. Use a wooden spoon to stir occasionally. You know when to stop, when the Cajeta has thickened like caramel, its drops take their time to let go of the wooden spoon once it is raised, once you see a delayed trail in the bottom of the pot as you gently move the spoon across the pot and you can see the bottom if only for a second, and the Cejeta leaves wavy marks on the spoon. Also, your house must be smelling like heaven by now. Pour it all in a large jar that will hold at least three cups. Cajeta is not only decadent, luxurious, with a perfectly balanced sweetness and a silky texture, it is also ideal for using with… everything! Crepes, chocoflan, to smear on pound cake, to dip fruit such as strawberries or bananas in. Wait! There’s more! You can make cute little cookie sandwiches (with Maria cookies, graham crackers or vanilla wafers, you can make smoothies and milk shakes, ice creams and glazes. The best way of all: just dip a big tablespoon and lick it off. And now that I remember, our friends in Celaya told us about some cookies made with Cajeta called Dulce Anhelo (translates to sweet yearning). And since I didn’t get to try them, what a sweet yearning it has become. Celaya: wait for me, I will be back for more. I may need to try your recipe. I love Cajeta and bought a plastic jar full in the market in Guadalajara 5 months ago, I have noticed it has an odd flavor now, and thinking I may need to throw out. I have not refrigerated it and maybe this is the problem? The person who I bought it from says it was made with cow’s milk. It was so delicious in the beginning, but now I am unsure I should eat it? If its commercial it can be kept without refrigeration, but if it was homemade it does need to be refrigerated. How many grams of piloncillo do you use? Cups can be very inaccurate, especially depending upon how the piloncillo is grated or the brown sugar is packed. Muchísimas gracias. It is about 17.5 ounces. That’s 496.117 grams – just a little short of half a kilo. Thank you for your very quick reply (especially for an older post). I’ve seen blogs where the blogger doesn’t even respond to questions asked the same day as the post. Thanks again! Muchísimas gracias y que le vaya bien. This looks so yummy! I’m going to make some today! My question is this. I am Lactose Intolerant which causes stomach distress. What can be substituted for cow’s milk? There are so many now such as Almond, Soy, Casu, Coconut Milks. Would the outcome make the same delicious recipe? I usually use goat’s milk, but I have heard of people making it with different milks. Give it a try and let me know how it goes! I tried making this tonight and it’s very chunky. I’m thinking I over stirred and I pulled off the layers that were building on the bottom and sides of the pot. Is it still OK to eat? Would it just be a textural issue? It took me FOREVER to shred the piloncillo and I’d hate for all the effort to go to waste. What could you suggest for next time I try this? Also, would it be a huge difference if I just use brown sugar instead of the piloncillo? Hi Pati. Thanks for the reply! I did taste it and it was AMAZING! It’s all gone now. The chunkier texture was easy to get over with the flavor. I think it was definitely cooking for too long. I had the heat pretty low and it didn’t thicken for a couple of hours. I’m trying it again this weekend, as I want to give some away for Christmas. Thanks for posting this. I’ll definitely be a regular visit of your site. Let me know when you want to go to Mexico. I’ll go with you! Cajeta is one of my favorites from Mexico. I never knew it was from Celya! 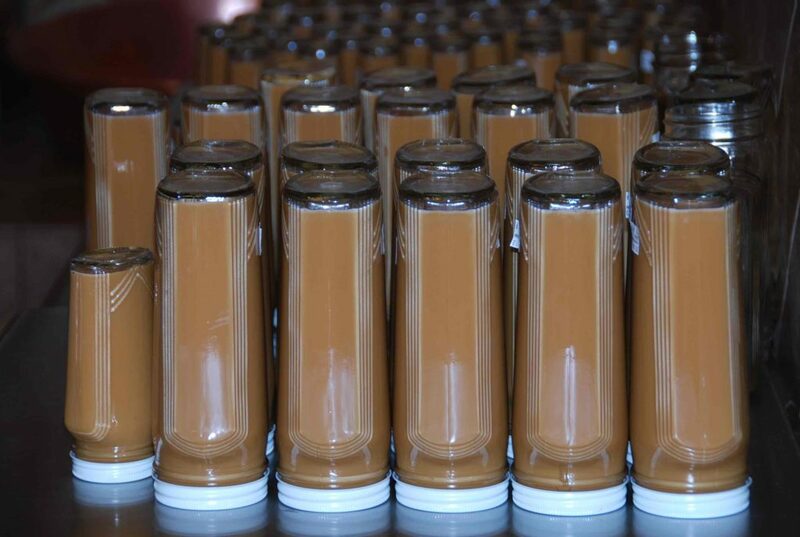 Cajeta Seriously??…. Pati you’re killing me.. Cajeta is an other of my favourite Mexican treats that I hold dear to my heart. Please tell me that your recipe is as good as the one in Celaya?? I would love to use it for Christmas presents! Patti, would love trying this recipe, but I am diabetic… I am going to try to find the sugar free yellow cake mix and banana pudding mix… Do you have any idea on how I may try the Cajeta sugar free??? Patti thank you so much for the Cajeta recipe. Would you please tell me what is Pilloncillo and where can get it? Thank you again for your help. It is similar to brown sugar! You should be able to find it at your local Latin market or specialty foods store. Thank you for trying the recipe! Dear Patti, I love your show and the opportunity to learn about the food from Mexico. There is such a great secret to be discovered about the organic farming and wines from all the different regions. I enjoy listening to you while I am in my kitchen and driveway grilling. I was wondering if you might point me in the right direction for a piece of beautiful cookware? Your copper pot or kettle, where could I buy one like that? It would be perfect for soups and seafood for me. Thank you, The Rooter River Chef. I bought my copper pot in the town of Celaya in the state of Guanajuato and lugged it back to the State, but you can find great options online! I have a lot of luck through Amazon. Can canned evaporated goats’ milk be used? Also, I’d like to make Milk Candy (Leche ??) like we used to get at the Monterey Mexican restaurants in Pasadena, Texas. It was soft & not sticky, like pralines. Lovely end to the meal! Thanks for your great show on PBS! Cajeta.. Oooh it’s soo good. But have a question to ask u.. Can use cajeta for flan? Que linda por tu mensaje, Cristina, gracias! I have seen a few of your presentations in the PBS station and I like it very much. I love the culture and food, but what I do not like is that I don’t hear the mexican music which is wonderful. I always hear music from Spain. I teach spanish and I always make sure the difference among the different countries. I say I would like more to hear the mexican music. With such a great variety of composers, musicians it will be nice to hear some of them. Thank you Violeta for your great input, I will pass this comment on to our production team. I’m anxious to try your cajeta. I’m sure the flavor is better than the sous vide dulce de leche I made a couple years ago, although it was good. It called for processing canned sweetened condensed milk in canning jars at 185 deg. for 12 – 15 hours. Do you think your recipe would work if processed longer (allowing for more time with the thinner fresh milk to thicken)? Hola Rob, I would make the cajeta as the recipe is written, then follow the instructions for canning given by the manufacturer of your canner. My first hunch is the heat: It should be at a steady simmer throughout. Mi next hunch is the milk, make sure you taste it before you boil it. Also, be absolutely certain every granule of sugar is dissolved…? I also don’t stir, I use a crock pot, then skim the foamy stuff off the top when it’s done. You might try it. 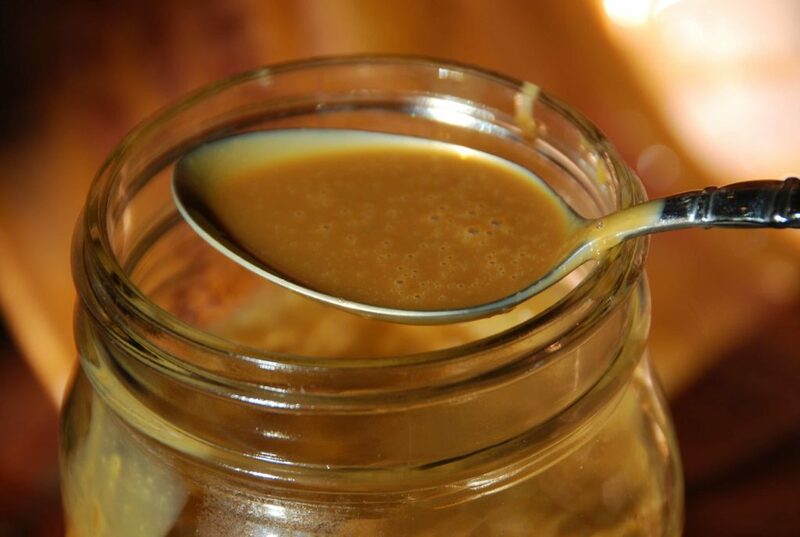 As kids we used to eat cajeta by the spoonful right out of the jar. I don’t remember it being stored in the fridge yet it lasted for a long time and never spoiled since it is so sweet. Is the above recipe from La Tradicional de Salgado or did you come up with your own? Why does it have to be kept in the refrigerator and even there only last for 6 months? Hola Jorge, Thanks for your message! I used eat it out of the jar, too (still do)!! My recipe is an adaptation of what I learned at La Tradicional. I keep it in the refrigerator because it is not processed for canning. Love your show! Would this recipe for cajeta work in an electric crock pot slow cooker? I’m unsure if the temperature would be high enough if cooked on the high setting. I wish you were on TV more often. Thank you! I have not tried it in a slow cooker… now that it’s the weekend, you can give it a try on just about any pot. Doesn’t have to be a copper pot! I love watching your show. I recently made your Dulce De Leche Cheese Cake. It won a Blue ribbon at our county fair. When the cherries around here were ripe I used the same recipe without the caramel topping and made a cherry topping everyone wanted the recipe. Donated the Caramel Cake to an auction for a boy in our area that was badly burned. It sold for $8.00. I will be trying more of your recipes. I will continue to watch your shows when I can. Hola Kim, Oh my goodness, so happy to hear your version of my cake won a blue ribbon! Is “cow’s milk” whole milk or can any percentage be used? Hola Elsa, Yes, I mean whole milk by cow’s milk. You may try with any percentage you like. I made it….it is so good! here’s my take. I can count on one hand the amount of times I’ve actually commented on a recipe, but this is that good it deserves special mention….I have Argentinian friends who put dulce de leche on everything, but to be honest I can’t handle it, the flavour is overwhelming for me, and I adore caramel in general. Fast forward to this summer, I now own dairy goats, so I got the notion to make cajeta for our friends with extra milk on hand. Needless to say this blew my mind and if any of it leaves the house I’ll be shocked. What a perfect mild, sweet, caramel for everything. i ate it on apples for breakfast and I think a pumpkin/cajeta cheesecake recipe is brewing in my heat ATM…anyhow thank you for the recipe, you can definitely add a convert to your list of followers. As for the jar of store bought (gifted to us) dulce in the fridge, adios!!! The show with your girl friends that you made the ribs and the drinks out in your back yard was great. But you made a dressing with Chile’s that you used in the salad you made with I think was files onions oil vinegar not to sure , but you and your sister tasted it out side your house you kept it in the fridge. In a jar. Can you give me the recipe it looked so tasty you cut the child with scissors. Thank you in advance would appreciate a response. Thanks again. Have a great Mother’s day!!!! Pati – I thoroughly enjoy your cooking show! Loved your Agave Chicken Wing and Cajeta recipes. San Miguel de Allende & Celaya are wonderful small Mexican cities that offer so much. Was able to spend 3 yrs there when my sister-in-law lived in San Miguel. If visitors “wander off” the traditional tourist places: Mexico City & Cancun, Mexico is an amazing place to immerse oneself in art, history, culture and great food. My mom also loves her copper pot from Celaya and her beautiful dishes for Comfort! Keep up the great work!! Hola K, San Miguel is one of my favorite cities in Mexico! You must have loved it there. Thank you for watching the show!! 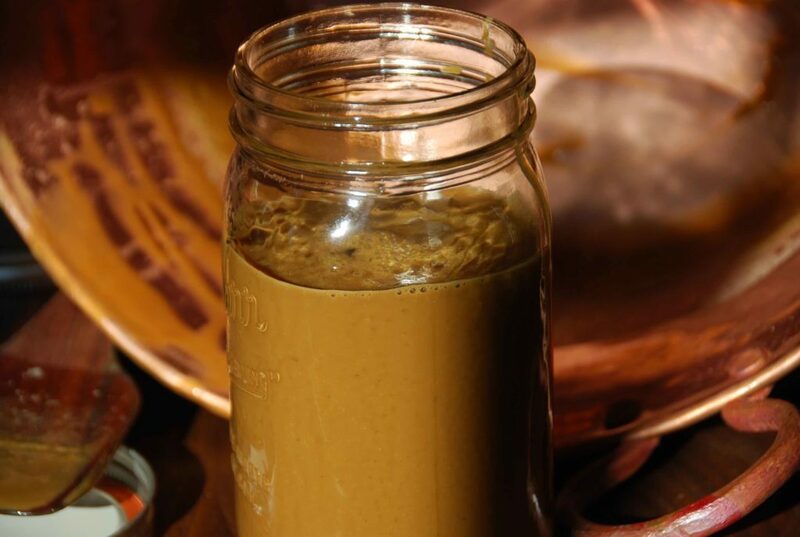 Pati – I thought you would give us the easy way to make cajeta! Take a can of condensed milk, set it in a saucepan with water and boil for a couple of hours (in the can), turn the can over and boil it for another couple of hours. Open the can and enjoy!!!! No watching or stirring except to keep the water up and boiling. Want you know that I have glass stove top as it s electric.. So have to use copper pot or not matter pot? Thank you Pati so much! Wow. This brings back so many childhood memories. I did not realize that cajeta was so easy to make. It was our favorite treat to buy when my family went to Mexico. Oddly, as kids we called it, “cow candy.” Not sure where we got the name. Maybe because when it is hardened, there is also a version called “dulce de leche”! I wanted to know how to make red chili for enchiladas. I watch your show whenever I can and love your recipes. Can you explain the difference between cajeta, leche quemada, and jamoncillo. I think I’ve got that the differences are mostly the milk and sugar quantities and color, but there are so many variations on each that I am confused. And I don’t see how to add colors to the jamocillo if it’s brown like the leche quemada and the cajeta. Cajeta is as you saw here, cooked down milk, be it goat or milk or a combination of both, with sugar and some added flavors like vanilla or rum optional. Leche quemada is more like a pudding that is finished off by being broiled, sometimes with sugar on top: think creme brûlée a la Mexican. Jamoncillo is the same thing as cajeta, but pecans or other nuts added many times, and cooked down until it thickens a bit more, then placed in a mold and left to solidify, then cut and wrapped in different kinds of paper. I really enjoy your program Patti. I love cooking, have always loved it. Tonight your sister and you made a pound cake, and you put the chocolate in the top layer. I can’t find your recipe. I am 82 years old, and cook every day. How much is the cook book? I love cajeta! I was born in a town called Cortazar. 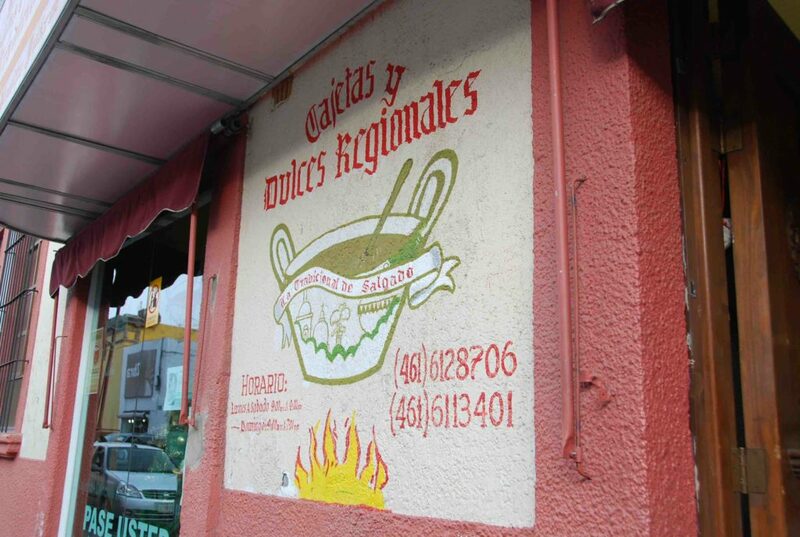 Right next to celaya where you can find the best cajeta in the state of Guanajuato. I grew up eating cajeta! It’s soo yummy with a bollillo doradito. Love the Cajeta recipe! A little tip for those who are concerned with over cooking or are unsure when its done. Whenever I make anything that thickens upon cooling and I want to check if its done. I keep a bowl of cool water with a smaller bowl floating inside on my counter next to my stove. This way in by dropping just a teaspoon full into the floating bowl I can see what the cooled consistency is in seconds without removing the entire batch from the heat. Hope this helps. This is such a great tip, Theresa! Pati- this post was a PERFECT find in my quest to order some of this super authentic cajeta from its place of origin. Wondering if you could recommend somewhere online (or a store such as one of these) where I could order it? I’m looking forward to making it, but I’d like to get the authentic stuff FIRST as a baseline and really want to order it. Any tips? Hi Pati! I’m excited to make my first batch of cajeta. I am hoping to gift the cajeta in petit ball jars for the holidays but with traveling etc, I’m not sure I can keep them refrigerated. Can I can the cajeta in a hot water bath without changing the flavor? Also, I was thinking of flavoring with sea salt, vanilla and bourbon-do you have a suggestion of how much bourbon to add and when? Yes you can Grace! And as far as the amounts of flavoring, I would go with 1/2 to 1 teaspoon sea salt, vanilla as is in recipe and about 2 to 3 tablespoons of bourbon: YUM. I’ve only had plain flan so the Impossible Chocolate Flan recipe on the show sounds heavenly! Thank you for sharing it on TV which I record. Do you allow the baked flan to cool slightly or to room temperature before inverting? Also, do you invert them just prior to serving? Can they be kept cold in the refrigerator before serving or will the cajeta simply become too hard? Hola Lora, Thank you!! I hope you will try the chocoflan recipe! You want to keep them in their ramekins and wait to flip out until you are ready to serve them. After baking, carefully remove from the water bath and let the flans cool to room temperature on a wire rack. Then, still in the ramekins, cover with plastic wrap and refrigerate for at least 2 hours before serving. Hi Pati I saw your show on Create channel. I love your show. I will make the Homemade Cajeta in a week. I’ve never tried cajeta before I saw it on your show. I made a small batch and it was delicious!!! Both my husband and daughter loved it. Thank you for the recipe!!! Great seeing you again on TV, The Chew, making those delicious looking ribs. I have not made the cajeta with a non dairy substitute. However, I encourage you to experiment and try! Hi Pati, I really enjoy your show and thanks for sharing this recipe. I was curious if I wanted to make envinada, how much ron would I add and when? also, not sure if you would know but my father has one of those copper pot. He uses it for carnintas, do you think if I use it for the cajeta will come out tasting porky?? lol. Have you made it using piloncillo? I tried making Jamoncillo and used piloncillo and it curdled the milk. Do you have a recipe for jamoncillo? The recipe I have is very much like cajeta. I’d like to try making jamoncillo again as it didn’t set firm and was curious if you had made it before. Hola Sergio, Thank you so much for watching the show! 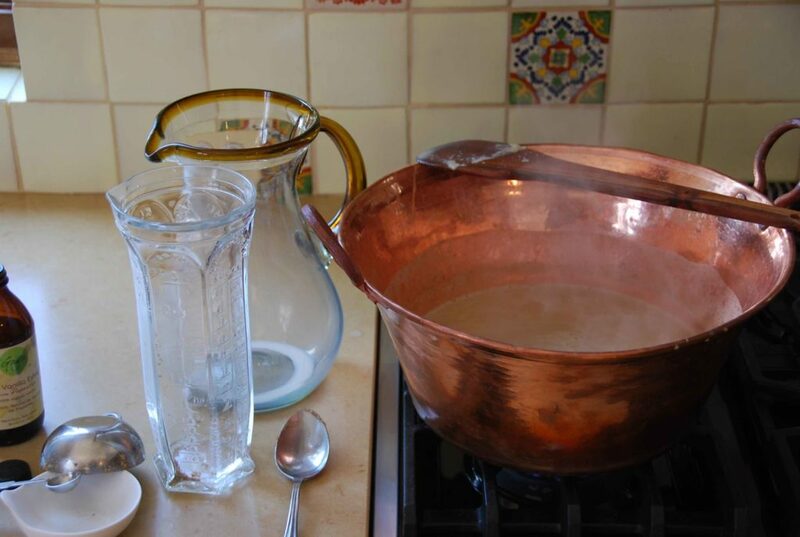 You can use your father’s copper pot to make cajeta; before using, clean it with mild soap and water and polish with a lime & salt like I do here: http://patijinich.com/2013/02/copper-pot-or-cazo-de-cobre-maintenance-and-use/. And, yes, you can use piloncillo to make the cajeta. To make Jamoncillo, just let it thicken more. For envinada, add 1/2 cup of rum when you put in the other flavorings too. I truly love the way you write about food. The process, the experience, the flavors! Ordering your book now. Thank you so, so much, Angelica! I am thrilled to hear you are getting my cookbook!! Got the Book and loved it should have order it.. instead of second thoughts. hope you come up with new book with new recipes of Mexican cooking’s..
Hello Paty 🙂 I was looking forward to this receipt when you made the crepes. I can’t wait to try..Congratulations on your show I love it. I try a few receipt and my husband and I, love them all. Thank you so much for sharing all this delicious receipt and making me loving more Mexico. p.s. a place that I love to visit.. I enjoy watching your show. I started watching in the hopes of getting an authentic – Mexican recipe for simple tacos and ended up getting so much more! The recipes are perfect for more because they’re so easy to make. I just wish there were more places to get the real Mexican ingredients around here! Well, I did find one place that’s kinda far from me. But at least there’s that. Thanks again for your show and I hope you’re on forever! Aww!!! Thank you so much, Henry! I enjoy doing the show so much & I’m excited to start working on season 3. Thank you for the generosity of detail in all the recipes you share and for your never setting smile. Hola Pati! Thank you for the recipe!! I live in a small condo in DC and do not have room for a new kitchen toy (copper pot). Can you suggest an alternative? Hola Cristina, Any metal pot you have in your kitchen should be fine, especially stainless steel or aluminum. Go for it! I actually make it in a crock pot and don’t have to stir. Set it on low for 8-10 hours or so overnight and skim the foam before jarring hot. Call me lazy, but it’s just as wonderful and way easier! Thank you so much for the recipe! We live in a very rural area and store-bought cajeta simply isn’t available. I also made your dressed up chicken milanesa, and two of my three picky eaters absolutely loved it. Now a family favorite, along with several other of your recipes! Hola Cathy, Oh my goodness, we did not want to leave San Miguel either!! Thank you so much for writing to me! Patti, Love your show, interesting and classy, I can’t ait to try cajeta. I love anything caramel. I eat Salamandra dulce de leche right out of the jar!!!! Thank you, Lucretia!! If you eat dulce de leche out of the jar, you might find yourself eating cajeta out of the jar, too, like me. Hola Susanne, Thank you so much for ordering a copy of my cookbook!! I’m so happy to hear you received it all the way in Germany! It would not be the same flavor, but fresh Anaheims would work as a substitute for poblanos. Prepare them in the same way the recipe calls for. Hola, I am curious about pot using… if we are using that copper pot to make that Cajeta, after using that could we be able to use that copper pot for cooking meat and other foods? or does it have to be use only for making Cajeta? I don’t think I would ever make cajeta, but I do buy it. Thank you, Lucia! San Miguel de Cozumel is lovely, too. This looks amazing! I’m going to make this. And how do I get a signed copy of your cookbook? I bought an advance copy of your cookbook. I love your show, as does my husband. I try everything I see you make, and decided I will never buy store bought tortilla chips again, they are so easy to make. Thanks for this recipe for the Cajeta. Is there a recipe you know of for making flan with it? Hola pati…Im from Mexico too and love ur show but I have a question..my cajeta didn’t end up like urs it was really thick( like the texture of sour cream) and I was looking other recepies and they always add corn syrup to prevent cristalization is that truth and make a difference? I know some other recipes use corn syrup…. but that really is not necessary in my view (there’s enough sugar in there for one thing!). It is just a matter of not letting it cook too long. 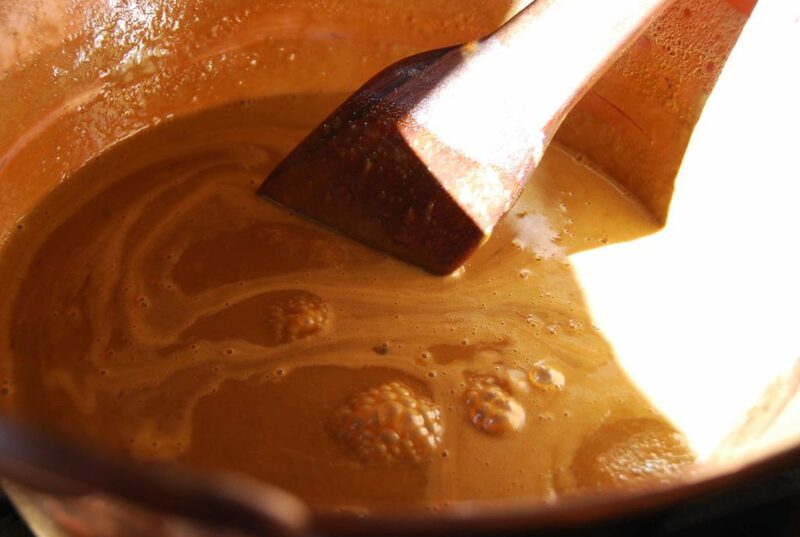 Remember it will thicken as it cools, so stop the moment it looks like a fluid caramel sauce. I’ve been experimenting with slow cooker cajeta for the last year and I think I have the solution to this problem. It’s just like any other candy making… if there are any granules of sugar that go undissolved, or are on the edge of your container, they recrystalize the rest of your caramel. 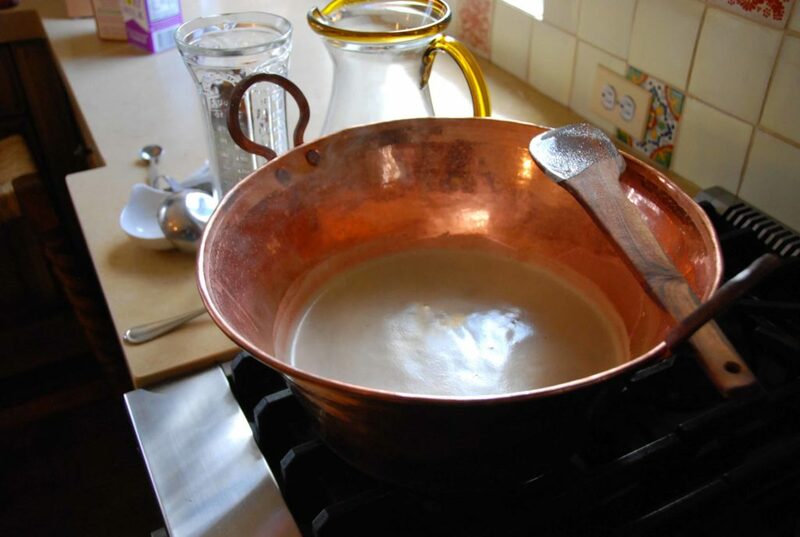 I have taken to sitting my milk and sugar out for an hour or two together and stirring occasionally, then wiping carefully the edge of the cooker to make sure there are no bits of undissolved sugar. I put my cajeta into swiss meringue buttercream frosting for chocolate cakes, or on popcorn, ice cream, pancakes & whipped cream, or in coffee, etc… it’s amazing stuff and my whole family loves it! I even use goat milk that is “goaty” and it fixes it so you can’t tell. Just finished a batch of french toast rolls…OH,MY,GOODNESS! If all your designs are so good my wife and I will be on the “fatboy diet” all too soon. Love what you do. Hi Pati, thank you for the great recipes, love your TV show, my husband and I watch it several times a week. You do a great job! I am from North East corner New Mexico. My mom made hamonsillo which looks like cajeta. I had never tasted Cajeta until recently. You mentioned it on your TV show so we bought some. It does taste somewhat like Hamonsillo but I noticed the taste of goats milk. The goats milk taste took me back a few years, we also had goats on the ranch and mom made goat cheese and also drank some of the milk. I am thinking of making your Cajeta recipe with cow milk instead of goats milk like you suggest. Do you have a recipe for hamonsillo? I am coveting the copper pot! So beautiful and the Cajeta looks amazing! Thank you for the recipe. I so love watching your cooking shows on PBS. I love the history and cultural aspects that you put into your TV shows. I grew up in the southwest and showing off a few dishes spoiled my husband, he will no longer eat chips from a bag. I fry them crispy for him, and for parties I make “suns” I cut 1/2 inch triangles out on the rim one neatly resting against the other, then cut two holes for eyes and cut a smile out. They are worth the effort. Ok my question,I made a pretty good Mole from Dona Maria (a friend from Oxaca taught me) but I am vegetarian now and miss my Mole. My happiest meals was a big plate of rich thick mole and tortillas. I am having Mole withdrawal symptoms. Thank You Pati for the shows, they are wonderful. Hola Dana, You are so sweet to spoil your husband with your homemade tortilla chips. I am so happy you like the show and really appreciate you watching and supporting it!! You can make mole vegetarian by mixing it with vegetable broth instead of chicken broth. It will be just as tasty! !